it’s cinco de mayo. and i used to teach spanish. and i turned in a major paper last night. let the festivities begin! if you avoid tequila and margaritas like me (sad, i know) then try making some white sangria tonight. 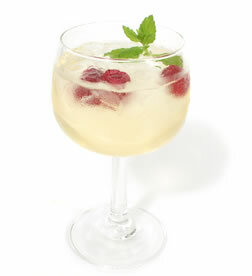 white wine, brandy, fresh strawberries and mint… a very refreshing way to celebrate the battle of May 5, 1862, when a small mexican army beat the french. yummy. ps… you can fit a whole bottle of wine in a nalgene bottle and still have room for brandy, fruit, and ice. perfect for sangria on the go!